LFG hopes that you want to do more than just play. 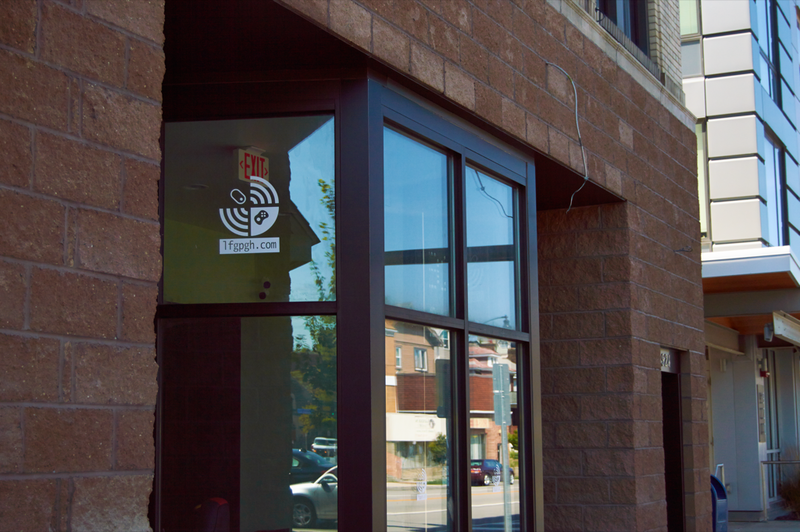 LFG is positioning itself as an unusual hybrid: it’s a co-working space combined with a pay-to-play gaming space. John Lange, one of the founders, doesn’t think that combination is odd at all. It grows out of his own interests: he’s an IT professional and a passionate gamer. John talks about that passion and how it develops his friendships in a talk he gave earlier this year. “I think a lot of people don’t have the same community that I’ve built with my friends and family and I want to share that with everyone,” John says. That community focus shows even now, as the space is still finishing construction. They’ve already hosted a game jam, and while they’re doing work, they’ve invited the neighborhood to pop in and play some games and chat. While I was there for a few hours on a Tuesday afternoon, several neighborhood kids popped in for a few rounds of games. By combining work and play in the same space, LFG hopes that a playful, open and inviting community forms. I think gaming startups and even established gaming companies would be interested in our coworking space because it feels really awesome, when you’re getting burnt out on working, to come see everyone in the gaming side smiling and laughing together and have that instant reminder of why you’re working and sweating and bleeding to build a game. The storefront portion of the space is the gaming floor. The first thing you’ll notice is the large television facing the street as a lure for the passerby. PCs line the walls, with ergonomic chairs that steal their design cues from race cars. Console “pods” take up the center of the floor- dedicated televisions and gaming machines for each player. The storefront is open to the public in the late afternoons and evenings. Behind the gaming space, separated by thick doors and sound-insulating walls, is the co-working office. John guarantees that between keeping gaming to the later portions of the day, plus the insulation, it’s a perfect space for heads-down concentration. There’s a small kitchenette and a modern conference room, which covers all of the vital amenities- with one more. 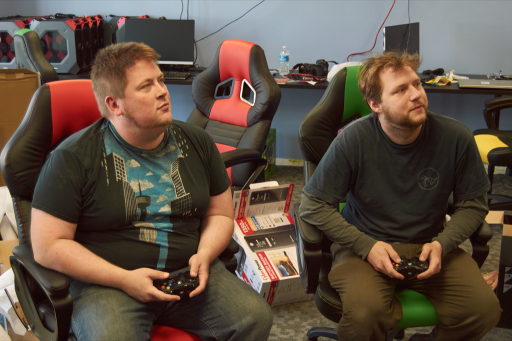 While the gaming storefront isn’t open to the public during core business hours, the members of the co-working space have unrestricted access to the building- including the games- 24 hours a day. I can’t imagine a better way of resolving conflicts in your team than settling your differences over a competitive round of a game like Speedrunners or Gang Beasts (two of the games John and his fellow founders were happy to beat me at while showing me the space). But you don’t have to be a member of the co-working team to start making games. Their gaming PCs provide all of the software that you’d need to make your own games, and they’re planning a series of technical events to teach the public how to do everything from write code to a “Build Your Own Console” event, where participants take a Raspberry Pi computer and turn it into a gaming console. I think a lot of people who are my age miss playing games together and a lot of the younger kids out never had the chance to really play games with their friends next to them. It’s too hard to bring your computer over to play Minecraft next to your best friend. It really doesn’t matter how good or bad the game is when your friends are next to you, playing with you. LFG has already secured their core equipment, and has enough funding to guarantee their operations for the near future. They’ve launched a Kickstarter, not to launch the space, but to secure even more equipment and make the space better. They’ve already cleared their modest goal of $2,000, and are shooting for stretch goals. You can check the space out yourself by visiting them at 924 Brookline Blvd, 15226. They’ve been doing a soft launch through September, and the gaming space goes officially live this Saturday, the 25th.